What is an Attendee Journey Map? Also known as an event roadmap or the attendee experience, this useful event planning tool is exactly what it sounds like. It’s a timeline that details every aspect of the experience your people will meet leading up to, during and after your event. This map is the core communication strategy for the full event lifecycle. If you’ve never used an Attendee Journey Map to organize and enhance the internal communication strategy surrounding your event, we highly recommend creating one. And, if you have used one before, there are always aspects you can improve in your strategy that will inform and delight your internal audience. How long will the full cycle of communication last? What channels will you use to communicate? It’s important to list these objectives and make sure you’re on the right track by surveying your people and asking their opinion on what new skills they’d like to learn or what kind of messages they think are important. This feedback can alter your strategy and add to the communication cycle and the event layout. Since learning and making connections are both large priorities for attendees, you can use information gathered from surveys on the strengths and weaknesses of your people and create a session where these people are teamed up according to their different strengths to help one another digest the content. If you don’t know what is important to your audience, you will miss the mark on engaging them. An Attendee Journey Map is the visualization of your plan. It’s a detailed overview of how and when you will deliver your message to your people. You need to decide not only how far in advance you’ll announce your event and begin the pre-event communication, but also how you plan to drive the message home on-site and how you’ll inspire growth afterwards. Though you’ll be providing your people with the bulk of the information on-site, the subject of your content should not be a surprise to them. You should build up the theme(s) you’re hoping to enforce beforehand with a well-planned pre-event communication strategy. For example, before a leadership conference, you can blast out quotes and statistics on great leadership every Monday morning in the months or weeks leading up to the conference. This will set the tone long before your attendees step foot in the venue and get them thinking about leadership – reflecting on their own style and how it can be improved. The more you prime your audience, the more receptive they’ll be to your on-site message. Your plan needs to include not only the content that you’ll distribute, but your means of distribution as well. Be tactical about the frequency of communication pushes. Don’t annoy or overwhelm your people by sending out new information daily. Give them time to process what they’ve learned or for some buzz to generate around the teaser they’ve received. Also in regard to distribution, don’t let great content go stagnant by constantly delivering it in the same manner. Use a combination of digital resources like email, video, social media, blogging or your intranet, mixed with physical resources like informational mailers, or instructions that will facilitate inter-office recaps and discussions of new initiatives. Include full details of the on-site communication experience, as this will be your biggest push. Will the main portion of the learning take place in general session or in break-outs? Make sure you keep your delivery method interesting and leave plenty of room for hands-on interaction from attendees. If your on-site content is clear, timely, and moving, your people will leave the event feeling inspired and ready to hit the ground running with your new initiatives. And that is great! But don’t let that motivation fade away. You have to harness the power of your messaging and keep distributing it, or there is no doubt it will eventually be forgotten. Your plan surrounding content and delivery method will already be laid out in your Attendee Journey Map, so let that map do its job and be the structure for your ongoing content. It’s time to survey again. And again. Check how well your content was absorbed, and the attitudes your people hold towards the changes they are expected to make. Keep checking this to make sure morale is still high around your objectives, and if it begins to dip, use this information to alter your content to increase clarity, or alter your distribution to a more disruptive and exciting medium. 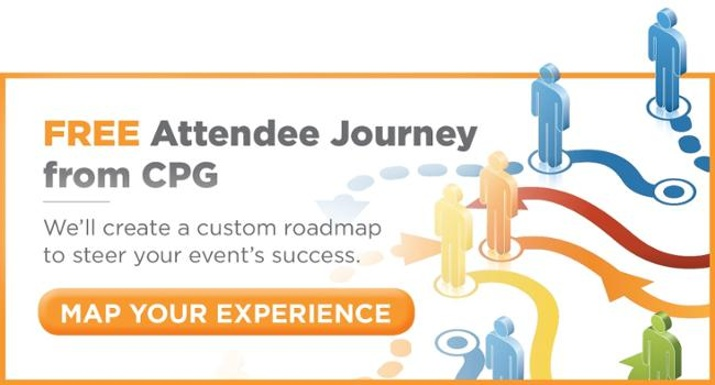 An Attendee Journey Map can enhance the planning process of your event in so many ways. It provides clear detail, lays elements out visually, and, like any good strategy, always leaves room for testing and improvement. Being able to fully see the journey your attendees will take as they are immersed in your brand experience will help create the best event experience possible!